in Sacramento/Carmichael in my backyard studio. Price: 170. + 40. materials fee. Click to see pics from recent workshops. 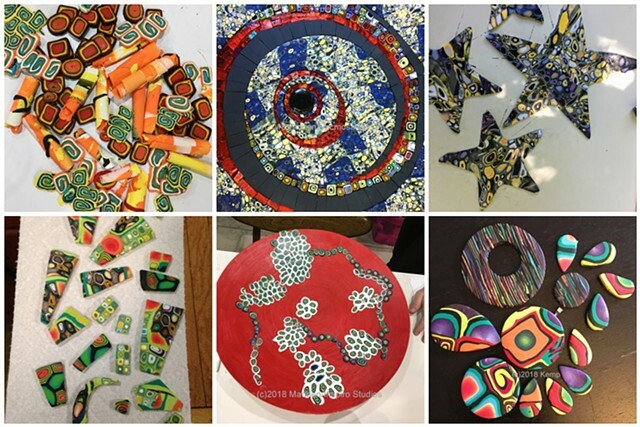 Join me for a fun exploration into polymer clay canes and patterns in this one-day workshop! You won't believe how easy, surprising, and convenient these polymer clay creations can be! I am wholeheartedly looking forward to passing these techniques on to you! It is an amazing material, especially for mosaic artists and embellishers who create work for hanging indoors. You can make tiles in the color, size, shape, and thickness you need! Wouldn't it be nice to be in charge of whether your tesserae is matte, or shiny, bright or subtle, flat or 3d, opaque or semi-transparent? You will learn all about supplies and tools and where to purchase, conditioning, creating several easy canes and how to combine them in interesting ways, how to shape and cut tiles, how to cure them, adhering, and even things you can do to further shape and cut fully baked/cured tiles, etc. By the end of the workshop you will have many polymer clay tiles to take home for your future polymer clay mosaic shenanigans. This is a TECHNIQUES class, the point of which is to give you as much information as possible. You will not have a completed piece at the end of this workshop. You WILL have a tremendous amount of information and an assortment of tiles that you can use on your own. Please email Susan (susan@scmosaics.com) if you have any questions or to make your reservation. It's gonna be fun!